A bedroom does not always have to be a bedroom. Junk, storage and spare rooms are perfect for creating new space. You can sleep guests who come to stay, hide away stuff you want to keep using clever storage design, and gain a smart home office haven for working in peace at any time to suit you. We’d like to help you increase the living options in your home to make greater use of the space. A loft conversion may be a viable option if all your bedrooms are already spoken for. We’ll maximise the areas in the eaves to provide effective storage while also creating a new living space accessed by space- saving spiral staircases. These lofty retreats can double as studio work rooms or teenage boltholes, or even a second sitting room for reading away from the TV. Central in many of these multi-purpose room schemes is the fold- away wall bed. Easy enough to operate and comfortable even for daily use in bijou apartments, these are perfect for rooms which will only really need a bed for occasional visitors. Neatly hidden away the rest of the time the space that is left breathes a whole new lease of life into the room, making it a versatile solution for improving your daily living environment. We would love to keep you advised of our exciting new furniture styles, design tips and inspiration from the world of home interiors. These won’t be every week and you are free to opt out at any time! Thank you for designing the wonderful bedroom improvements. We are really pleased with Hartleys' work and are now reaping the benefits. Having taken a shot in the dark with Hartleys, after seeing a promotion in the Yorkshire Post, we would just like to say how pleased we are with the furniture. From our initial meeting with Neil through to the final design and the excellent service Aaron gave in making the furniture fit our less than uniform walls. Many thanks to all concerned at Hartleys. We were very pleased with the alternative location you suggested for our furniture, and the carpet fitted you recommended was very efficient. Delighted with the finished product. Exactly what we wanted, thank you. I just wanted to thank you for completing our two wardrobes so efficiently. And to say that your fitter did an excellent job! He even very kindly re-installed part of the skirting around the cupboard with a lot of care, so that the whole job looks marvellous. 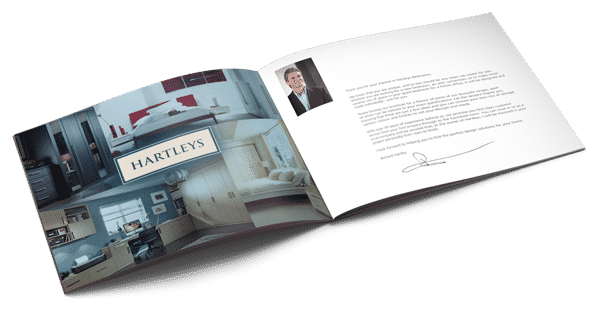 Hartleys provided an impressive service from start to finish. We are really pleased with the quality of the wardrobes and the workmanship. Any challenges encountered during the installation were fully discussed with us before they were actioned and resolved. Many thanks to Richard, Aaron, Heather, Alan and everyone in the Hartleys' workshop. Very satisfied. The fitter consulted us during fitting, and left the room clean and tidy.